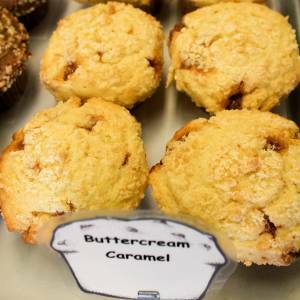 There are two words for clouds in Heaven: Buttercream and Caramel. Now Frank was studying in the Holy Land on a spiritual baker’s crusade when he found himself on a ship sailing for the Sistine Chapel where he had a vision of sweet, delicious, edible nimbus clouds swirling around all of mankind. The revelation left him mute for three months, at the end of which he produced his divine masterpiece: The Buttercream Caramel muffin. Take a bite of Paradise.